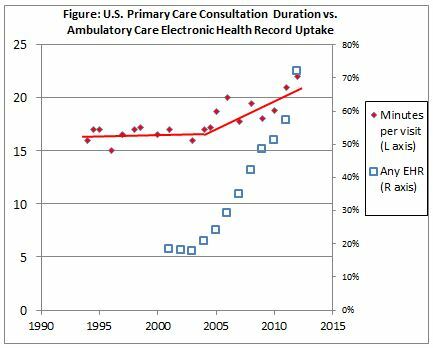 Increased U.S. primary care consultation duration due to EHR burden? We read with great interest the comprehensive review of primary care consultation duration in 67 countries between 1946 and 2016 by Irving et al (1). This review is especially timely given rising physician burnout, as well as dissatisfaction among both doctors and patients in the U.S. As the authors note, many physicians are frustrated by the limited time available to interact with patients. The increasing time of U.S. physicians with patients surprised us. Primary care physicians in the U.S. rank fifth out of ten high-income countries on dissatisfaction with time spent per patient (2). What explains this apparent mismatch of quantitative trends and satisfaction? One candidate explanation is that much of physician time is spent on activities other than communication with patients. According to an observational study in 2015 of 57 ambulatory care physicians (primary care, cardiology, and orthopedics) in 16 practices in 4 states, of time spent with patients in the exam room, 53% was spent face-to-face, 37% on the electronic health record (EHR) and desk work, and 9% on administrative tasks (3). Thus, we wondered if the U.S. trend in primary care consultation duration reported by Irving et al aligned with historical trends in EHR uptake. In the Figure (http://blogs.bmj.com/bmjopen/files/2018/05/Figure-US-Primary-Care-Consul...) we compare these two temporal patterns. Examination of the Irving data suggest to us two time periods with different slopes: nearly flat from 1992-2004, and then rising from 2004-2012. The rising period aligns well in time with rising EHR uptake (4). Although comparison of these two trends is only suggestive, we believe it provides strong cautionary evidence against interpreting the rise in consultation duration as a rise in physician-patient communication. Physicians do not view the increasing EHR burden favorably. The ambulatory care study noted above found that physician satisfaction results from providing high quality medical care and caring for patients, while EHR/desk work and the complexity of reimbursement and administrative tasks contribute to dissatisfaction (5). Physician satisfaction with the EHR is far lower in the U.S. (52%) than in eight other wealthy nations (64% to 86%) (2). While these issues are beyond the scope of Irving et al’s review, we believe that attention must be focused on primary care consultation duration that entails undisturbed communication with the patient, absent attending to the computer. This time is central to caring for patients and its continual undermining is a risk to the health of both patients and physicians. 1. Irving G, Neves AL, Dambha-Miller H, et al. International variations in primary care physician consultation time: a systematic review of 67 countries. BMJ Open. 2017; 7(10):e017902. doi:10.1136/bmjopen-2017-017902. 2. Osborn R, Moulds D, Schneider EC, Doty MM, Squires D, Sarnak DO. Primary Care Physicians In Ten Countries Report Challenges Caring For Patients With Complex Health Needs. Health Aff (Millwood). 2015 Dec;34(12):2104-12. doi: 10.1377/hlthaff.2015.1018. 3. Sinsky C, Colligan L, Li L, et al. Allocation of Physician Time in Ambulatory Practice: A Time and Motion Study in 4 Specialties. Ann Intern Med 2016;165(11):753-760. 4. Hsiao C-J, Hing E, Ashman J. Trends in Electronic Health Record System Use Among Office-based Physicians: United States, 2007–2012. National Health Statistics Reports, No. 75, May 2014. 5. Colligan L, Sinsky C, Goeders L, Schmidt-Bowman M, Tutty M. Sources of physician satisfaction and dissatisfaction and review of administrative tasks in ambulatory practice: A qualitative analysis of physician and staff interviews. October 2016. Available at: ama-assn.org/go/psps.